The Mayor of London, Sadiq Khan, has unveiled plans to mark the anniversaries of the 2017 terrorist attacks at Westminster, London Bridge, Finsbury Park and Parsons Green. The campaign, developed in consultation with the bereaved families, survivors, emergency services and local councils, will use the hashtag #LondonUnited. The hashtag will be projected on to the Houses of Parliament (pictured above), London Bridge, Finsbury Park Mosque and Parsons Green Tube station to mark the anniversaries of each attack. Jack Morton has partnered with the Mayor’s Office to create the #LondonUnited commemoration. 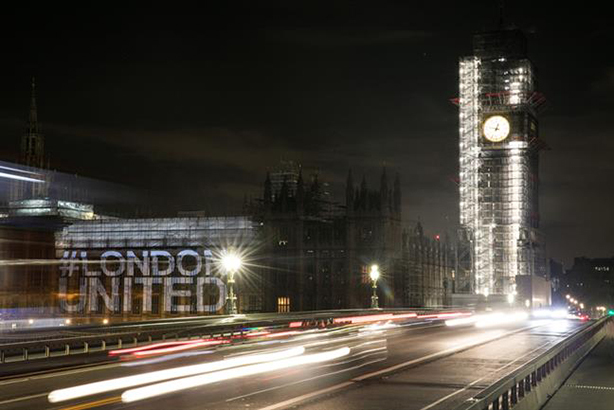 The period of remembrance began today with the first projection at Westminster and a social media campaign encouraging people to share their #LondonUnited messages, which will be projected at City Hall as part of a digital ‘book of hope’. A remembrance space at City Hall will be open to the public until the anniversary of the Finsbury Park attack on 19 June and London United exhibitions, designed to highlight London’s resilience and hope will take place across the year.